SACRAMENTO, Calif. - Nathan Burtenshaw and Stetson Lawrence received the good news they were hoping to receive this week. Tests on Burtenshaw’s right elbow and Lawrence’s left foot came back negative for any serious injuries and both riders will he headed to California for this weekend’s Sacramento Invitational. Burtenshaw originally believed he had torn his UCL in his riding elbow in Glendale, but an MRI showed no tear, Burtenshaw said on Monday following a follow-up appointment with Dr. Tandy Freeman in Dallas. It was good news for the Aussie after he had to overcome a broken collarbone and a torn ACL last year to qualify for his first PBR World Finals. Meanwhile, Lawrence had already planned on riding in Sacramento even if his foot was broken, but he was relieved when X-rays showed no fracture. Lawrence had broken his right ankle last year and had to miss three weeks. Lawrence has drawn Wicked Hou (1-2, UTB) for Round 1 at the Golden 1 Center Friday night. Burtenshaw is slated to face Strange Cargo (1-0, UTB). Fans can watch Round 1 exclusively on RidePass at 10:30 p.m. ET. Meanwhile, Matt Triplett says he is week-to-week with his right wrist (riding hand) injury from last weekend in Glendale. Triplett was evaluated this week in Dallas and he said he does not need surgery. Triplett is one of eight riders out for Sacramento because of injuries/retirements. Also not competing is 2016 World Champion Cooper Davis (concussion), Kaique Pacheco (left knee), Fabiano Vieira (left shoulder), Dener Barbosa (reconstructive shoulder surgery), Lachlan Richardson (ankle), Guilherme Marchi (retirement) and Valdiron de Oliveira (retirement). Davis withdrew from the Sacramento Invitational on Thursday afternoon because of his concussion from last week. He was replaced in the draw by Mason Taylor. 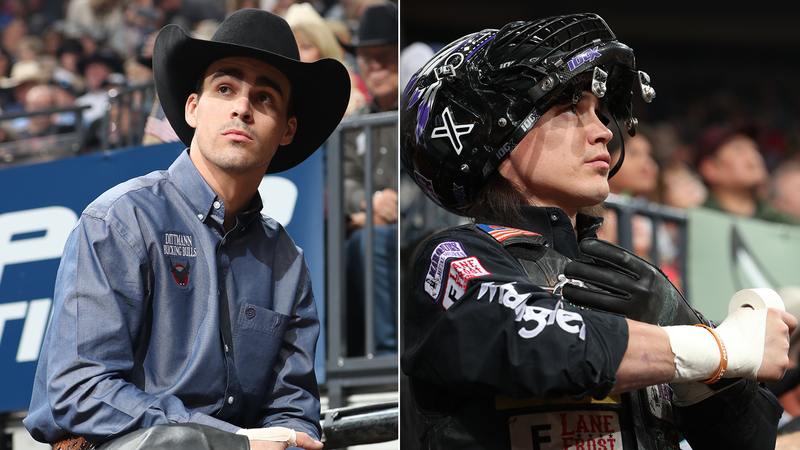 There are eight alternates riding in Sacramento: Rubens Barbosa, Cannon Cravens, Lucas Divino, Lonnie West, Emilio Resende, Paulo Lima, Juan Carlos Contreras and Taylor. Cravens is returning to action after missing Glendale with his right calf injury. The No. 10 ranked bull rider in the world is trying to earn one of five Top 35 draw spots that will open up following the fifth UTB event. Following Oklahoma City, alternates for the Unleash The Beast will be based off the 2019 world standings. That is when five draw spots will go to riders that finished outside of the Top 30 in the 2018 standings. World leader Jess Lockwood brings an 862.5-point lead on No. 2 Jose Vitor Leme into Sacramento. Lockwood has drawn High Carbon (0-0, UTB), while Leme will take on Cool Customer (3-3, UTB). Lockwood and Leme have won seven of the 16 UTB rounds this season. This weekend’s Velocity Tour invite is Daniel Tinsman. The 23-year-old used an 89-point ride on Slow Ride to win the Velocity Tour event in Toledo two weeks ago. Sacramento will be his second career UTB event following a buck off at last year’s Billings, Montana event. Tinsman is set to take on Dynamite Cap (2-0, UTB) in Round 1. There are four rematches in Round 1, highlighted by Joao Ricardo Vieira taking on Crazy Days for the third time in his career. Last week’s Glendale winner previously rode Crazy Days for 84.75 points at the 2016 premier series event in Colorado Springs, Colorado.